The snow is flying, transforming Lake Tahoe into a winter wonderland. What better way to get outside and experience the beauty of the season than by strapping on some snowshoes, grabbing a set of poles and setting out among the snow-laden trees and crisp mountain air? Those looking to play in the snow at Lake Tahoe are spoiled for options, from resort skiing and snowboarding to snowmobiling and off-piste backcountry adventures. 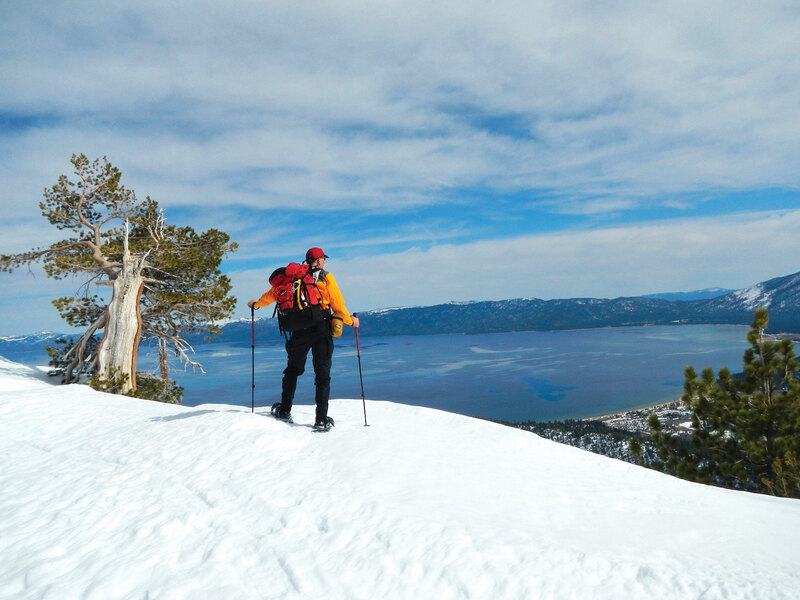 But snowshoeing offers some distinct advantages over other winter sports: no crowds or long lines; freedom to explore Tahoe’s backcountry when it’s arguably at its most beautiful; head-clearing, mood-boosting solitude; and a cardio and strength-building workout that’s second to none. Those who venture into Lake Tahoe’s backcountry should always remain vigilant about the risk of avalanches, even on the easiest of routes. Start by checking the avalanche forecast at www.sierraavalanchecenter.org and avoid any area indicating a risk of avalanche. Locating and staying on a trail is more challenging in the winter. Fresh or blowing snow and low-hanging clouds can obscure the route and disorient an outdoor enthusiast, and getting lost in the woods is especially dangerous in frigid conditions. In addition to a map and compass, consider downloading a reliable navigation app to safely negotiate backcountry trails. Two good options include Gaia GPS (for both iPhone and Android) and Backcountry Navigator (for Android only). Practice using the app and download the map of the applicable area before heading out so it’s available on the trail if there’s no cell coverage. At just under 5 miles round-trip, this South Shore beginner route is a true Sierra gem. 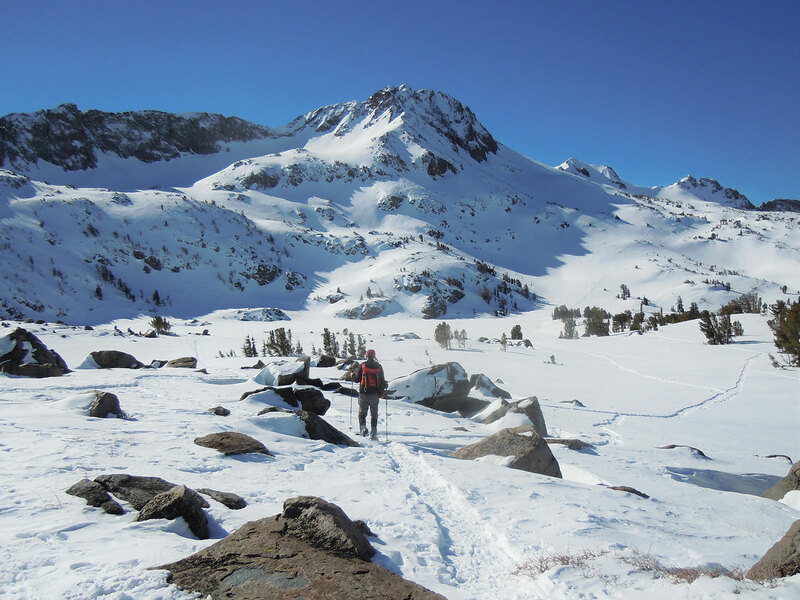 Offering stellar views, an easy-to-follow trail and moderate terrain, a trip to snowy Lake Winnemucca is perfect for those who are new to the sport and want to build their snowshoeing confidence while taking in some of the area’s most spectacular winter scenery. From the Carson Pass parking lot, follow the trail as it climbs gradually through towering Jeffrey pine and fir trees, then opens onto a large meadow with Round Top Peak soaring in the distance. Lake Winnemucca lies nestled in a bowl just below Round Top Peak. Continue over moderate terrain for about two miles to the top of a rise overlooking Lake Winnemucca. The view from the rise is jaw-dropping: jagged Round Top Peak standing over the lake like a proud sentinel, the lake itself a soft blanket of white, several rocky outcroppings providing an ideal place to sit and soak in the view. 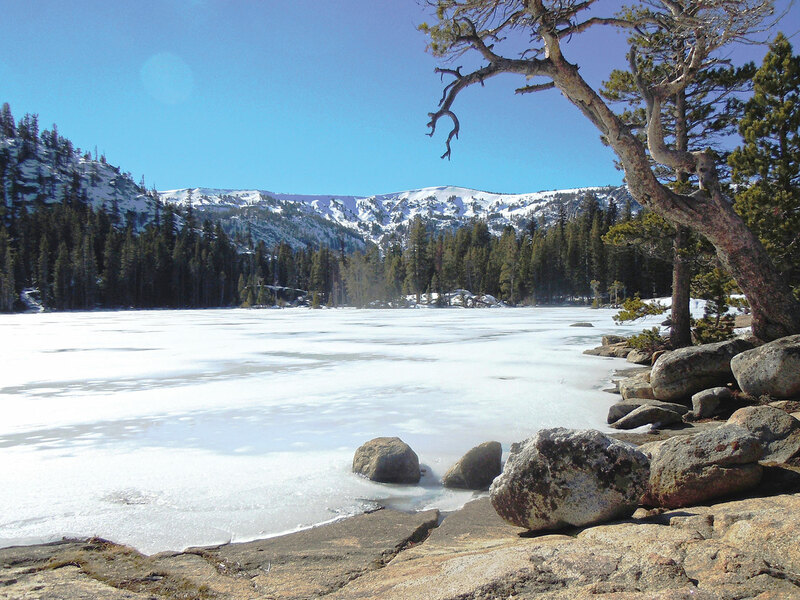 Given its ease of access and moderate terrain, Lake Winnemucca is a popular winter destination for snowshoers and backcountry skiers, so don’t expect to be alone on the trail. But it is an easy, big-bang-for-the-buck route, the perfect way for a beginner snowshoer to get the feel for what makes the sport special. After getting comfortable on snowshoes, consider tackling a more difficult route. A good option is the trail from the Big Meadow trailhead on Highway 89, near South Lake Tahoe’s Luther Pass, to lovely Dardanelles Lake. At around 7.2 miles round-trip, this moderate route has some short steep sections that will get the heart pumping. From the Big Meadow trailhead, the first half mile climbs steadily before opening into the aptly named meadow with unobstructed views of snow-capped Stevens Peak in the distance. After traversing the meadow, the trail is a sustained but moderate climb for the next 1.1 miles before it descends steeply to the turnoff for Dardanelles Lake around mile 2.3. The last 1.3 miles of the trip are moderate and enjoyable as the trail winds its way down to the lake. Use a map and compass or navigation device to locate and stay on the trail; the wooden signposts marking the turnoffs to Dardanelles Lake likely will be obscured by snow. Arriving at Dardanelles Lake is like stepping into a postcard. With an impressive granite dome at one end and snow-capped mountains beyond, the lake takes serenity to the next level. The large granite areas ringing the lake are perfect for enjoying a packed lunch, which will taste extra good after the hard work. For those who are comfortable on snowshoes and want to build up strength with some moderate but sustained ascents and descents, a trip to Dardanelles Lake is an ideal option. At around 9 miles round-trip, sections of which involve sustained, lung-busting ascents and challenging route finding, this trail is only for the heartiest, most experienced snowshoe enthusiasts. Make no mistake about it: This route’s no joke, and anyone attempting it needs to be comfortable identifying areas of potential avalanche risk. But those with solid snowshoeing skills who enjoy spending the entire day in the remote backcountry will be rewarded with some of the most spectacular views in the Tahoe area. And unlike the easier, more popular routes, it’s possible to go the entire day without seeing another person—a far cry from tedious resort lift lines. Starting from the back of the Bayview campground, opposite Inspiration Point near Emerald Bay, the trail climbs steeply and steadily for approximately 2 miles past Granite Lake to the overlook below Maggie’s Peak. 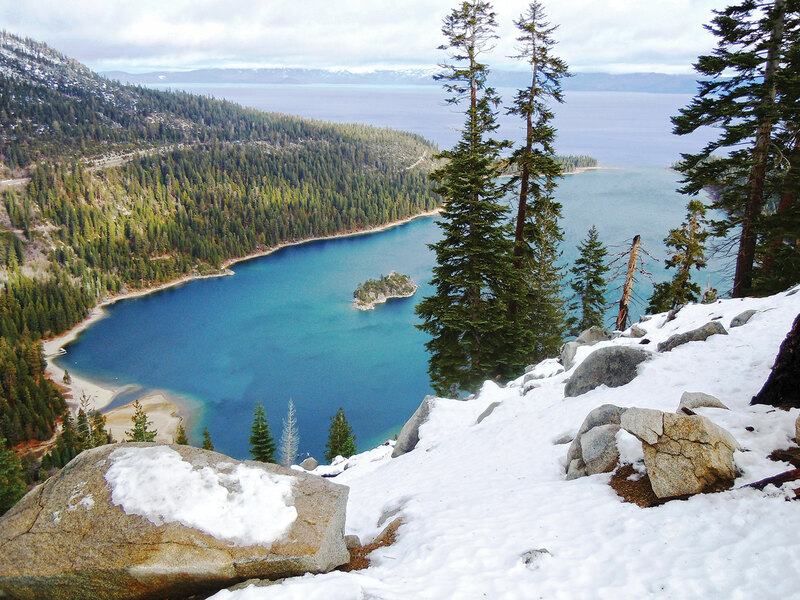 Along the way, enjoy stunning views of Emerald Bay and Lake Tahoe—the higher the elevation, the better the views. Reaching the area below Maggie’s Peak, the hardest work of the day is done. The trail flattens and meanders for several miles to Upper Velma Lake. Because snow often buries the wooden trail markers and the most efficient winter route to Upper Velma is cross-country, make sure to carry a map and compass or reliable navigation device. Arriving at Upper Velma, take some time to soak in the area’s natural splendor. The waterfall cascading down from Fontanillis Lake is even more dramatic in winter when the frigid temperatures transform it into an icy sculpture. If solitude is the goal, this is the trip to take. Returning from Upper Velma, take a short detour to the top of Maggie’s Peak. The easy climb to the summit leads to some of the best panoramic views the area has to offer of Lake Tahoe, Emerald Bay, Granite Lake and Cascade Lake—a big reward for a little extra work. Joan Wharton is a South Lake Tahoe–based writer and photographer who loves nature and gets out as often as possible to hike, mountain bike, ski and snowshoe.